Survey findings point to Great Britain as the country in Western Europe that is the most impacted by late payment from export customers. Slightly above the 41.2% average for Western Europe, 44.3% of the total value of the business-to-business (B2B) sales of respondents in Great Britain was transacted on credit terms. This does not differ from what was observed last year, and places Great Britain in the cluster of Western European countries (along with Ireland, Spain, and Italy) with an average value of B2B credit-based sales that is more or less in line with the average for Western Europe. This cluster falls in between two other groups of countries, which show a totally opposite approach to granting trade credit in B2B transactions. On one hand, there are Austria, Switzerland, Belgium and France, whose respondents showed a very risk-averse approach to granting trade credit. On the other hand, there is Greece, Sweden and Denmark, which appear to be the most inclined countries in Western Europe to offer credit terms in B2B transactions. On average, British respondents seemed to be more likely to grant trade credit terms to domestic than to foreign B2B customers. 48.2% and 40.3% of the total value of domestic and foreign B2B sales respectively were on credit (survey averages: 44.8% domestic and 37.7% foreign). This suggests British respondents perceive the risk of payment default to be more likely to arise from credit-based sales to foreign than to domestic customers. This is the same perception of respondents in Southern Europe (Greece, Italy, Spain). Around 90.0% of British respondents (88.0% in Western Europe) experienced late payment of invoices by B2B customers over the past year. This resulted in an average of 44.6% of the total value of B2B receivables remaining unpaid past the due date. This is above the 40.0% average for Western Europe, and is around 3% higher than last year. Much of this increase appears to stem from an upswing in late foreign payments over the past year, which greatly outweighs that on the domestic market. This may explain why survey findings point to Great Britain as the country in Western Europe that is the most impacted by foreign late payment. 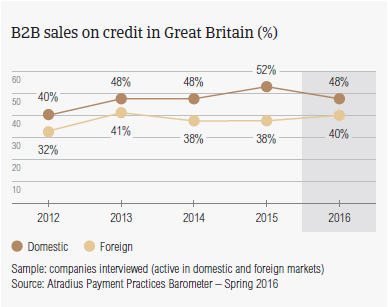 This tallies with British respondents’ selective approach to granting trade credit in B2B transactions. Late payment of invoices (domestic and foreign) is reflected in the Days Sales Outstanding (DSO) figure posted by British respondents. This averages 59 days (survey average: 48 days) and is over two weeks longer than last year. This may reflect a relatively poor performance in collection of high value outstanding invoices, particularly foreign invoices, than in most other Western European countries. One in four British respondents expect their DSO to worsen over the next 12 months. In light of the above, it is not surprising that more respondents in Great Britain (22.3%) than in Western Europe (17.8%) are concerned about maintaining sufficient cash flow this year. Collection of outstanding invoices in emerging markets and accurate assessment of customers’ payment default risk are also considered by British respondents to be challenges to business profitability in 2016. 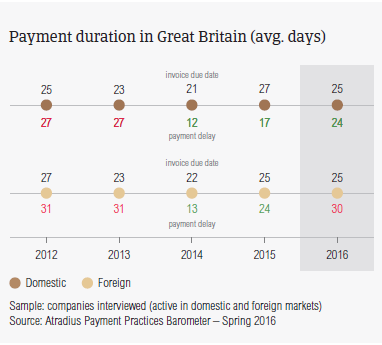 B2B trade credit payment terms extended by British respondents average 25 days from the invoice date (below the 31 days survey average) and do not vary between domestic and foreign customers. Compared to one year ago, payment terms granted to domestic B2B customers appear to be slightly shorter (by an average of 3 days). Foreign payment terms, in contrast, did not vary at all, suggesting that the perception of British respondents is that there was no improvement in payment default risk arising from B2B trade, particularly with foreign customers, over the past year. 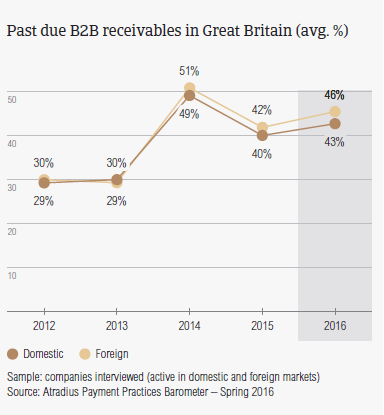 Despite such a strict payment policy applied by British respondents, past due B2B invoices were settled by domestic and foreign customers within three weeks of the invoice due date. This is around one week longer than last year, and is consistent with the survey average. As a consequence, respondents in Great Britain could turn overdue invoices into cash only, on average, 52 days after invoicing (survey average: 53 days). This may have an adverse impact on businesses cash flow position and tallies with the earlier mentioned findings. Reason why British respondents are concerned about maintaining sufficient cash flow this year. In line with the survey pattern, British respondents most often attributed late payment of domestic B2B invoices to liquidity constraints of customers. This was cited by more respondents in Great Britain this year (49.4%, compared to nearly 58.0% in Western Europe) than last year (43.6%). In line with the survey pattern, British respondents are also of the opinion that outstanding invoices are paid late by customers due to an intentional use of these for their financial advantage. 26.8% of respondents in Great Britain reported this (in line with 28.2% in Western Europe), down from 35.6% last year. Contrary to the survey pattern, late payment from foreign customers was reported to occur most often due to inefficiencies of the banking system. Markedly more respondents in Great Britain (nearly 37.0%) than in Western Europe (23.1%) cited this, suggesting that this affects timeliness of foreign payments in Great Britain more than it does in most of the countries in Western Europe. As a consequence of late payment of commercial invoices, notably more respondents in Great Britain (25.4%) than in Western Europe (18.3%) had to take specific measures to correct cash flow. This is again in line with respondents’ concern about cash flow. Nearly 24.0% of the British respondents (in line with the survey average) had to delay payments to their own suppliers. This may explain why more respondents in Great Britain (nearly 39.0%) than in Western Europe (33.7%) plan on checking their customers’ creditworthiness and payment history more often this year. 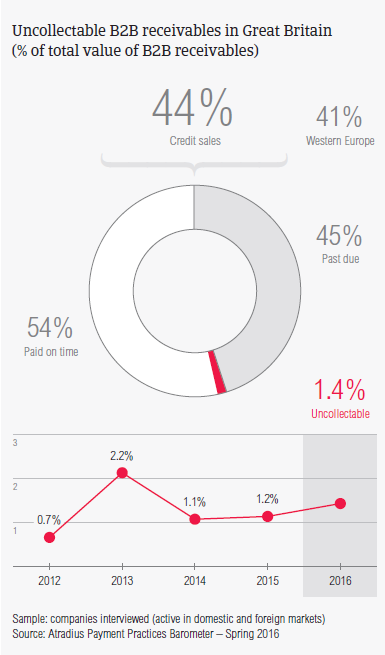 The proportion of B2B receivables reported by British respondents as uncollectable (1.4%) is in line with the 1.3% average for Western Europe. Domestic uncollectable receivables were written off almost as often as foreign ones. Uncollectable B2B receivables originate most often from the construction, financial and business services industries. 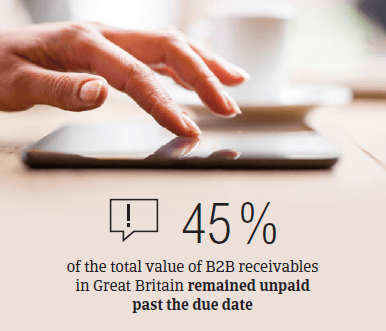 For more respondents in Great Britain (28.6%) than in Western Europe overall (19.7%), B2B receivables were uncollectable mainly because the customer could not be located. At the same time, more British respondents (31.1%) than in Western Europe overall (25.6%) reported that write-offs were mainly due to the high costs of pursuing the trade debtors, particularly on export markets. For more insights into the B2B receivables collections practices worldwide, please see the Global Collections Review by Atradius Collections (free download after registration), available from October 2016 on www. atradiuscollections.com. Survey respondents in Great Britain reported granting trade credit terms mainly to B2B customers in the consumer durables, construction, business services, financial services and overall services industries. Invoice payment terms extended to B2B customers in the financial services industry are significantly higher than the country average (averaging 30 days from invoicing). B2B customers in the construction industry are the slowest payers. On average, it takes them twice as long as customers in the other industries to settle past due bills. The construction industry generated an above average (for the country) proportion of overdue invoices. According to most of the respondents (around 60%) this is likely to be chiefly due to liquidity constraints of customers in this industry. Around 30.0% of British respondents expect payment practices of B2B customers in the construction industry to deteriorate over the next 12 months. No significant change is anticipated in respect to payment practices of other industries.